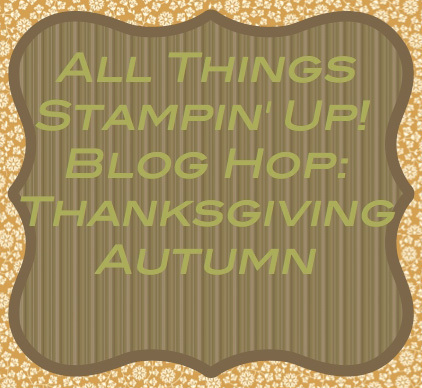 All Things Stampin` Up Blog Hop! Hop Along With Us! That’s right! I am part of a super cool blog hop! So, c’mon along.. grab your favorite beverage, and blog hop with us fellow Stampin` Up Demonstrators! All projects featured will be All Stampin Up products. We will also share the “recipe” of each project we post. We will be featuring Thannksgiving and Christmas goodies along with Valentines Day, Easter and Spring! It starts this week and end in May, 2012. You will see a posting about the blog hop every first Tuesday of the month, by 8am EST. Enjoy!